← Are You A Douche For “Writing In Public”? January 12th, 2011, hot off the presses from Lake Buena Vista (aka Walt Disney World), a fire broke out in the attic area of the Enchanted Tiki Room attraction at 5:30pm. The sprinklers sprayed, the guests were evacuated, no one was injured, the firefighters doused the flames, big win all the way around. So why is this a “Whack-A-Doodle Wednesday” story and why does God hate the Tiki Room? Because God loves me and understands, like I do, that the Tiki Room is an abomination that must be cleansed from the Earth. So they re-did the ride. 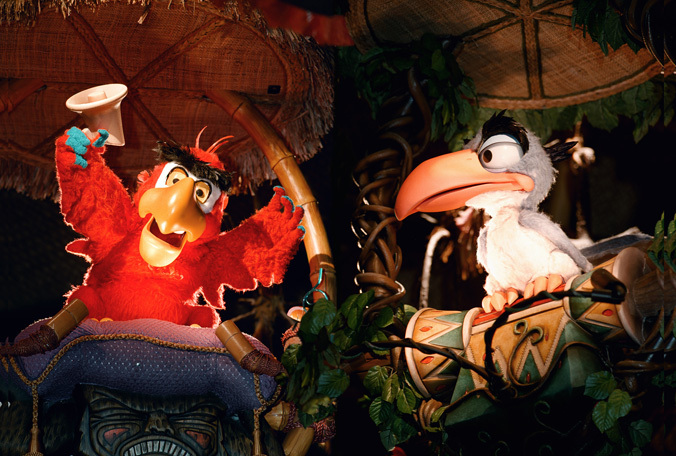 The obnoxious Iago has taken over the Enchanted Tiki Room “Under New Management” with his wise cracking, Hollywood Agent manner with the staid Zazu to act as a foil. He also has the good sense, in an audio animatronic way, to look embarrassed. That pretty much says it all. The show itself is not well done, the jokes aren’t funny and Iago is annoying and a bit scary. I know I’m not alone in wishing the place would dissolve on the spot. Well, God evidently heard our prayers. New rumors are surfacing that Iago was damaged beyond repair by the fire in addition to water damage on the perch that the birds are attached to. It seems Zazu sustained bad water damage as well. That seems to me, if the rumors are true, that the new birds were the target of this fire, Iago in particular. No official determination on the fires origins have been made. However, I say “make lemonade out of nasty, feathery lemons” and make this attraction into something special. If you don’t want to go back to the original show, you can add new, original characters with a clever script. I call shenanigans on this whole “synergy” concept of plugging in minor characters just so you can sell plush toys and pencils that haven’t moved before. If you look at the Muppet 3D show at Disney Studios, you will see they invented a character named Bean the Bunny who is the catalyst of the whole show. He is cute, engaging, sells stuffed toys (Hell, I bought one!) and doesn’t take away from the whole classic Muppet experience. Do that people! Please let the idiot parrot remain fried and bring us a new character. I would like to suggest a stunning, peacock-blue parrot named Apollo. Posted on January 26, 2011, in Uncategorized and tagged aladdin, fire, florida, iago, new management, sucky show, tiki room, walt disney world, zazu. Bookmark the permalink. 3 Comments. Those things scare me too….that is not a Tiki room…that is a shopping mall the night before Christmas…SCARY! Can’t make me go! Bean the bunny is an old Muppet character. He was the star of my favorite Jim Henson movie “The tale of the bunny picnic” He was also in Beanbo (a Rambo spoof). I am so happy to hear that! I never saw the bunny picnic and thought he was brand new. Well, at least I can safely say he is a little known character they constructed the show around and it works great. Unlike Iago.